"Oh Mommy you are colouring the girl's with the big heads, I love those girls", these are the words of my 8 year old daughter when you sat beside me to watch me colour Snuggle. I had quite the little chuckle at her comment, thinking to myself gee I never really looked at these images that way before. I can tell you that she is right they do have big heads but they are just too cute not to work with. This is the result of our colouring that night. Misc. - Bazzill Cardstock Walnut & Papaya, Basic Grey Puccini, Nestabilities Labels 5, Lace Sepia Kaiser Craft flowers, Buttons, Cinnamon Stickles...I pulled out my little Elna sewing machine and did a bit of stitching around the boarder. Again the inside of this card is just as the outside, here is a close up. 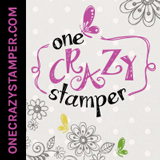 Okay I'm SUPER excited to announce that my on-line store www.onecrazystamper.comis the PROUD sponser of Sunday's with Crissy Challenge #5 which runs for the next two weeks. I was very happy to be asked by the ever talented Crissy Armstrong to be the very FIRST sponsor. Crissy is a supertalented artist who currently draws for two stamp companies and one digi company. Please visit Crissy's personal blog here as you will be totally WOWED by her work. In addition to Crissy's personal blog PLEASE take click over to the Sunday's with Crissy blog to see the Blog Candy and all the DT's work for this challenge called "Relish to Embellish Challenge". It's worth the click!!! Next up is my post for today I have a wonderful image from The Greeting Farm for you today called TT Max. This image is set to retire from The Greeting Farm collection so grab it while you can, I think it is just an adorable stamp. I made this card for my 20 year old son to give to his Grandfather. I know he's 20 but he loves to play video games and I know his Grandfather will think it's cute & I hope you do as well. The cardstock is Bazzill - Walnut & Fawn, the patterned paper is from Basic Grey's Max & Whiskers collection called "Hercules". I used nesties to cut the circles and squares and a couple of SU punches for the greeting. The greeting is a rub-on from the never ending stash. I added some baubles and brads from the endless collection of supplies as well. Please let me know what you think, comments are most welcome! Do you ever start working on a card and get side tracked with other projects? I sure do. I coloured this lovely Princess Anya from The Greeting Farm at least 2 weeks ago...and just finished putting her together last night. I was trying out a new colour combo for hair..well at least new for me. I stamped Anya onPrism Simply Smooth with Memento Black Ink. The pearls are Kaiser Craft, the flowers are Prima. I received Smooch Paint a couple weeks ago for my online store and just couldn't wait to give it a try...I used it on this card for the flowers, crown, wand and dress. I must say I haven't been as excited about something new in quite a while as I am about Smooch Paint...this stuff is just way too cool, on this card I used the Illuminate Top Coat! It's an amazing way to add that sparkle and bling without alot of fuss and it dries fast. I air brushed the flowers & pearls because they were originally white. The cardstock is Bazzill "Pauly Poo & Papaya", the patterned paper is a piece from my stash. I don't know how well the Smooch Paint shows up in this picture but it is so beautiful in the real! Comments are always so welcome, thanks for stopping by to visit! I promised to post this card a couple of days ago...but life just has a way of stopping you from getting the job done sometimes. Well I'm up and at it early today just so I can get my card up to share with you. We are all set here in Canada for a long weekend, now who doesn't love a long weekend. It's also the weekend to get all the annuals planted in the garden..only problem for me is I still have to go purchase these annuals. But that's all part of the fun isn't it! Now onto my card share for today. As I mentioned a couple of days ago, I taught a class last weekend on Easel cards, if you haven't had a chance to try them please do they are just so much fun to make. I create mine in 6 x 6 just because I love having all the extra space to work with. On this card I used Fluer Anya from The Greeting Farm, I used her a couple posts back on another card I really love this image, it's also one of my daughter's favourites. I chose bright summery colours for this card combination. The image is stamped with Memento Tuxedo Black ink on Prism Simply Smooth cardstock. I love using Prism to stamp on when I'm colouring with Copic's because it bleeds VERY little and I always seem to be very happy with the end result. That's would also be considering my colouring skills are on par that day...LOL! There is a lip on the bottom of the cardstock, just for a boarder punch. A friend of mine created a card doing this so I totally cased her idea as I thought it was very neat. I hope you all enjoy today's post...sorry again she was late & thanks so much for visiting. Almost all of the materials I used to create this card are available on my website here. Please feel free to let me know what you think. I just couldn't wait to starting colouring some of my new arrivals, The Greeting Farm Stamps. My first pick, although it was very hard, was Fleur Anya. My 8 year old daughter helped me choose which stamps to order first for the website. I think she did a fine job! I used a Spellbinders Die - Labels Twelvefor this one, I coloured with Copic's as listed below. I added some flowers & Stickles. I get many emails asking about bows and why mine lay flat...the answer is the most amazing little gizzmo called the Bow Easy. I love that little tool, it comes in two sizes one for large bows and one for small bows. Have a wonderful day & thanks so much for stopping by. I would love to here what you think so please leave a comment!